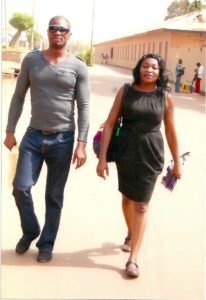 Hi, guys, my name is simply Nnamdi, and as you can see, that’s my wife and me in the photo. I am going to be concise with ‘About Me’. I am a person that has a lot of interest in bodybuilding. I have been in the business of bodybuilding (not for financial gains, but for personal fitness) for several years. People say I look younger than my actual age, well that could be attributed to the gene but certainly to a healthy lifestyle too. That is what inspired the formation of this website. To reach out to many with my knowledge in an area I have so much passion for. To help those that are interested in losing weight and building a better body structure. Appearance can be so much to us because it can add to our self-worth or confidence and above all a physical fitness that will provide us with longevity. Wealthy Affiliate University has helped me to realize this dream and vision, by giving me the support and resources I needed to establish this website to an authority level. I am married with a beautiful daughter and I am a professional blogger. You can now go to the website and start checking out our helpful tips on Bodybuilding, weight loss and more. Nevertheless, do consult with a professional in the field before applying anything you read on this website. This is because everything you read here on this site is usually my opinion and it will only be wise to get the consent of a professional before applying any recommendations from this site. Founder of How To Build That Body. There is a LOT of information on this site, and far more useful and practical information than you tend to find on many other sites, too. You’ve already caught my interest, so I’ll certainly be back to sift through what you’ve presented in more detail. I’m not sure bodybuilding is quite my thing, but the information you’ve given about weight loss and general healthy living should be relevent to most people. Thanks for sharing your experiences! Thanks so much, and please do visit again. This is a serious site for anybody wanting the answers. Lot of information to be taken in by a few visits. Most enjoyable and well worth the time. I’ll be back. Thank you so much Travis. I bet you will not be disappointed as you continue to visit. Thank you Jason for dropping by. Please do visit again. Great Job Love everything about your site. Great value you bringing to the table. Nice website Nnamdi, your doing a great job. I do’nt think the last picture is necessary, the first gives a better picture of what your site represents though it’s needs to be brighter. I think it’s blur. I also think you need to improve the colour of your homepage it’s a bit dull. I think more pictures of what your websites represents on your homepage will make your site more catchy. Over all your are doing great. One being into fitness as well I enjoyed your site. Very informative and with great ideas. Fitness is a big issue and knowing things to do that can help you with fitness and getting healthier is a great tool. Wish you all the best with your website!